Each of your visits, as father’s 20 years ago, together with the honorable Iancu Caragiale, is an outstanding event for our establishment. And thus, I would like to prove my chivalry and share with your dear wife, Mme Măriuţa Baciu, the recipe of our grilled minced meat rolls, the most appreciated in Bucharest, as you may know. I have the outmost trust in you to not betray the secret of our most delicious grilled minced meat rolls. I received this secret from the great chef Mr. Tică Preoteanu, my ancestor, who led the kitchens of Caru’. I humbly address the same request to your dear wife, Mme. Măriuţa, the most exquisite hostess that I have the pleasure to meet. The perfection of the dinners in your house, for which I thank God, determined me to reveal the secret of the most appreciated dish that honors our name in Romania and abroad. The grilled minced meat rolls are a dish made of beef. When done, they are of 7-8 cm long and around 3 cm thick and are served as snack with a beer or as starter or even as dish in themselves. 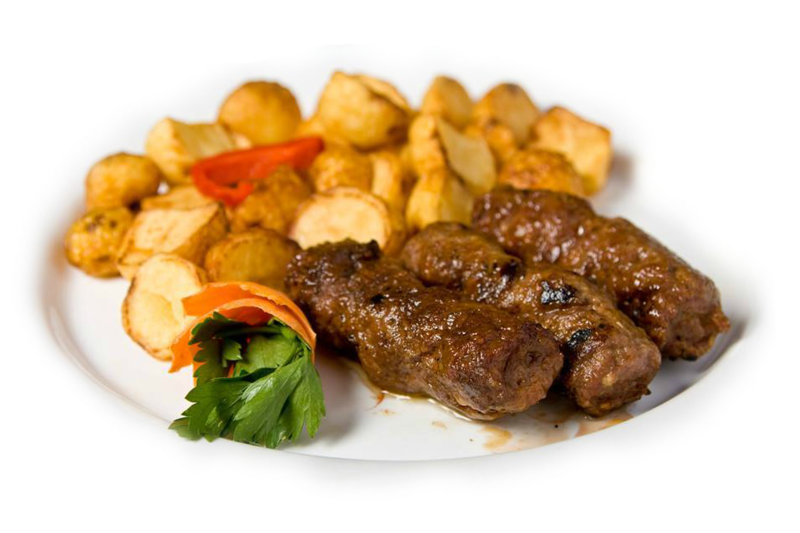 They come from the Balkans, Serbia, but we can meet them in Greece and Turkey, wherefrom the Romanian cuisine took them. As the name shows it, they are small rolls and this is exactly their name: grilled minced meat rolls in Muntenia, made of meet with spices, meant to delight the guests. They are to be served only freshly grilled with cutlery or with a toothpick. Take the beef with fat and mince it twice to be as small as possible. If the meat is too lean, add some beef fat or, if you don’t have any, even some sheep fat, around 100-150 g per kg of meat. Don’t use under any circumstance, bacon, ham or pork as they only ruin the taste and savor. Boil some beef broth of 500 g of bones for each kg of meat. For more than 5 kg, add to each 5 kg of meat, one more measure of the spices above. Knead the meat in a dish for one hour, adding baking soda from the beginning, mixed with the lemon juice. Half of the bone broth and all seasonings, without the garlic, are added slowly and little by little. The mixture is covered and put in a cold place for one day and one night, then taken from the cold, left for a few hours to thaw. Knead for a half of hour with the rest of the broth. Make some garlic sauce with warm water – a knob for each kilogram of meat. Leave it to rest half an hour. Squeeze the garlic sauce in cheesecloth, add the garlic juice and knead the mixture for a quarter of hour. Put it in a cold place overnight. For three hours before being grilling and serving the grilled minced meat rolls, take the mixture from the cold place to thaw and warm; three hours later or when the mixture is thawed, form the grilled minced meat rolls as big as a thumb, brush them with oil on all sides and ends and leave them to dry for an hour. Grill them on wood or coal, brushing them with garlic sauce to make a crust. Our cooks turn each grilled minced meat roll only three times while on grill. When grilled, the grilled minced meat rolls will become smaller – wherefrom their name. Don’t leave them to overcook or to dry off the juice of the spices. If grilled slowly, they will be too small, dry and bland. Serve them with fresh buns or loafs of bread, with Mutard de Dijon or flavored and spicy mustard or with salt and peppers. This is the only way to get tasty grilled minced meat rolls as they are said to be only here. We know how the so-called cooks in inns and taverns in the outskirt of the town, without knowledge or to save money, use pork, horse or sheep. Not only they don’t get small when grilled, but their taste and savor is not the true one. A big mistake is to be stingy with the seasonings, in particular the garlic and pepper. The garlic is exactly the main part of the famous taste of grilled minced meat rolls. I am happy to share with Mme. Măriuţa this little secret as I know she will not pass it along, as I reveal it only to the text Maitre Cuisiner who will replace me at Caru cu Bere! The grilled minced meat rolls cooked by her are very tasty, but my taste revealed immediately the lack of coriander, star anise and Turkish cumin. With these spices, Mme. Măriuţa grilled minced meat rolls will be unrivaled! I hope to see you next month when you come back with your regiment, together with Officers Dinu and Vatache to savor a plate of grilled minced meat rolls and some beers together! I wish you good health, good luck, asking you to send my best wished to Mme. Măriuţa, the most perfect housewife and Lady in the high society! May God help you!